Did you know South Dakota has a burgeoning wine region? Or that Chicago is really a bit of a beach town? Or that you can visit a Corn Palace, a mechanical T-Rex at a drug store, and the world’s largest ball of twine within just a few hours? The large swathe of area know as the Great Plains or America’s Midwest was full of surprises — most of them good! 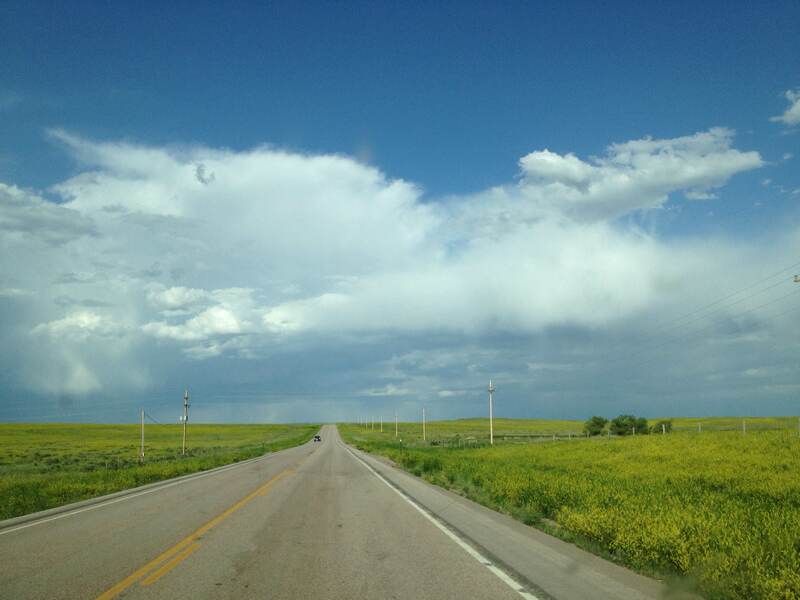 But yeah, it’s also hours and hours of driving through flat, rolling grasslands and farms. Pretty at first… maybe not so much after 12 hours. It’s pretty, but this scenery gets a liitttttle old after a few hours. After leaving Wyoming, we wound our way around the last of the Rockies and Gros Ventre wilderness before hitting the plains. From there, it really was a mixed bag of tiny towns, grasslands, and pretty wildflowers until we reached the South Dakota Black Hills, which really do look black from far away thanks to the dark colored pine that thrive in the area. The Black Hills are full of caves, wildlife (including yet more bison), and amazing granite formations, particularly in Custer State Park. 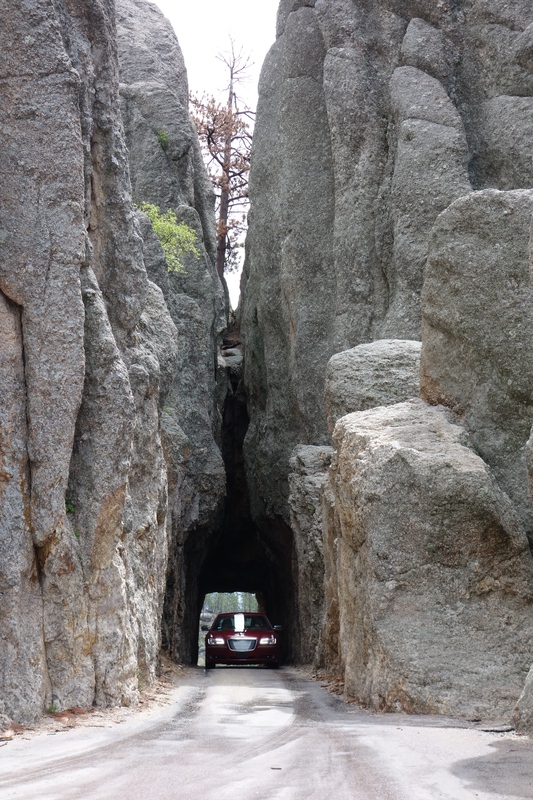 Custer State Park – where you can drive right through the natural wonders you came to see. 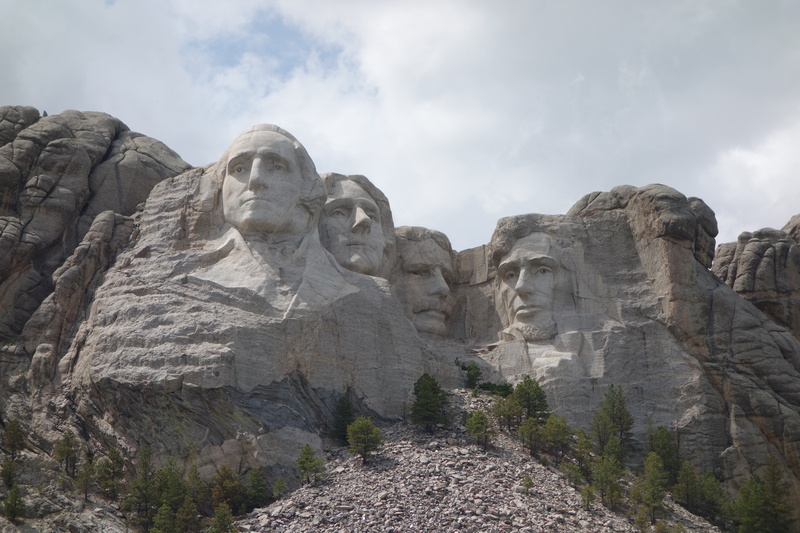 There’s also Mount Rushmore, which proved to be more impressive than I expected. Not far from there lies the “rebuttal” to the preservation of white American history in the form of an enormous, still-in-progress Crazy Horse Native American stone monument. We didn’t see this one up close but I’m not sure you need to — you can easily make out the profile from miles away. Yep, that’s four dudes carved into the side of a mountain. Quirky stops. 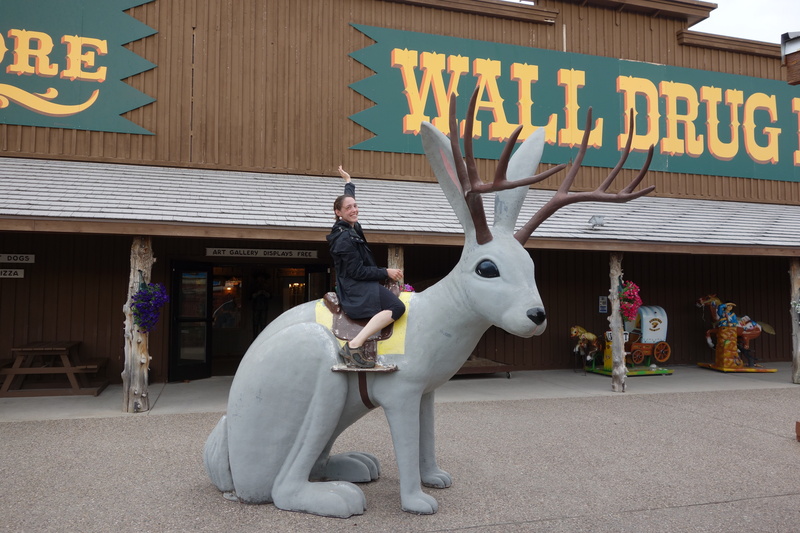 One of the tips was to make a detour past the ridiculous Wall Drug store, which sort of has to be seen to be believed. Here is a photo of me riding a giant rabbit (or deer? I still don’t know) to give you an idea. Photo not pictured — a giant, mechanical T-Rex. 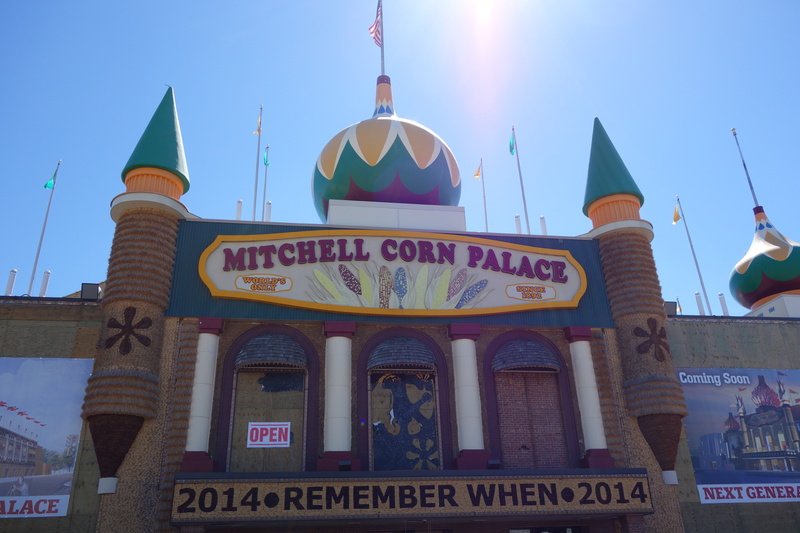 We also visited the Corn Palace and narrowly avoided the Spam Museum. I was devastated that the World’s Largest Ball of Twine was off the highway in Minnesota and slightly out of our way… next time. Badlands National Park. After leaving the, um, intriguing sights of Wall Drug, we kept heading through the plains towards the Badlands. Suddenly, the ground seemed to just drop away in front of us, revealing an enormous canyon. Formed from erosion from a river over a million years or so, it really is spectacular, especially in the late evening dusk. Each layer of sediment is clearly defined, giving the canyon a multicoloured look. After another big day of driving through the plains (and seemingly endless toll roads), we finally reached Madison, Wisconsin, a cute college town in the middle of Dairyland USA. We basically ate cheese and rode our bikes around a lot — a day well spent. 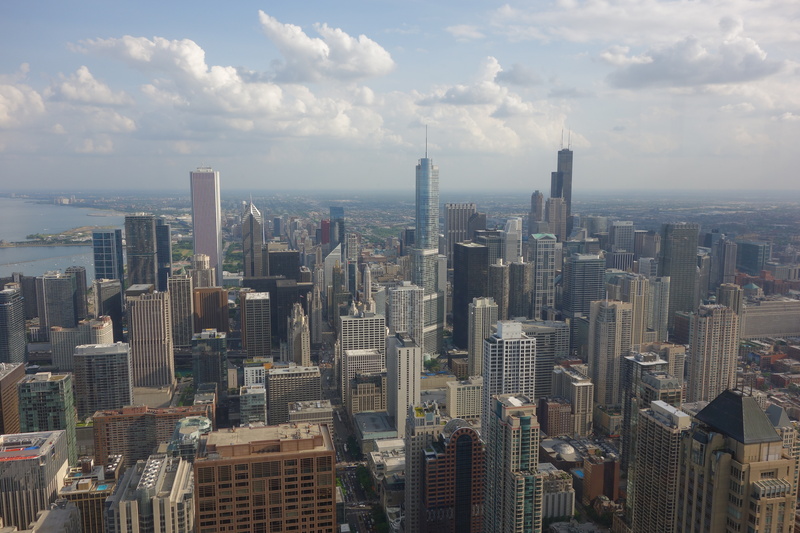 From there, it was only a hop skip and a jump to the metropolis of Chicago. Again, the Windy City was different to what I expected. Firstly, it’s prettier, with amazing sculpture-filled parks, soaring skyscrapers, and beaches along the waterfront. Secondly, it was bloody hot. Our first full day was 32 degrees and humid — maybe not the best day to choose to cycle in from our Wicker Park/Bucktown hostel! But the lakeshore ride alone was worth it and Chicago turned out to be a surprisingly bike-friendly big city, with separate bike lanes most of the way (even if they were riddled with pot holes). It’s also obviously a lively city. We rocked up the day after blues fest but still enjoyed a free evening concert in Millennium Park (where you can bring along a picnic and wine), blues at a bar midweek, and could choose between a number of White Sox games. We basically ate a lot and walked a lot in Chicago. Deep-dish pizza was a winner, although I was a also a big fan of the Rick Bayless casual brunch spot Xoco. Deep dish pizza was the best! And best of all — people were so friendly! Even if the architecture reminded me a bit of New York, the constant politeness and even recommendations from complete strangers was definitely much more mid-west! Fun, friendly, and full of surprises — we’re definitely fans of this part of the states. We’re now back in Canada, after stopping to visit friends in Toronto. Quebec City is up next, then Montreal for Jazz Fest. I’m hoping Dan remembers some French, since I know none. Parlez vous anglais, I guess?